Regina Carter in Montreal or Quebec City? Inform me about the next events for Regina Carter. Enroll yourself to our priority waiting list for Regina Carter to be alerted when new tickets are available. Filling this form doesn't engage you to any purchase. 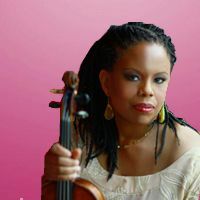 American violinist Regina Carter will be at the Montreal Jazz Festival on June 30th at 19h at the Gesù. The women who played with the biggest including Aretha Franklin, Lauryn Hill, Billy Joel and Wynton Marsalis will present her latest album, Reverse Thread.